In baseball, especially at the beginning of the season, there is an increase in elbow problems amoung young players. 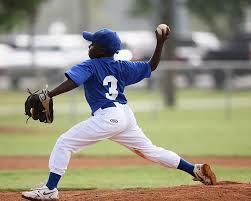 The most common elbow problem is the medial apophysitis named « Little Leaguer or Youth Pitcher Elbow ». The elbow joint is composed of 3 bones : upper arm bone (humerus) and 2 bones in the forearms (radius and ulna). Muscles, ligaments and tendons keep the elbow joints together. 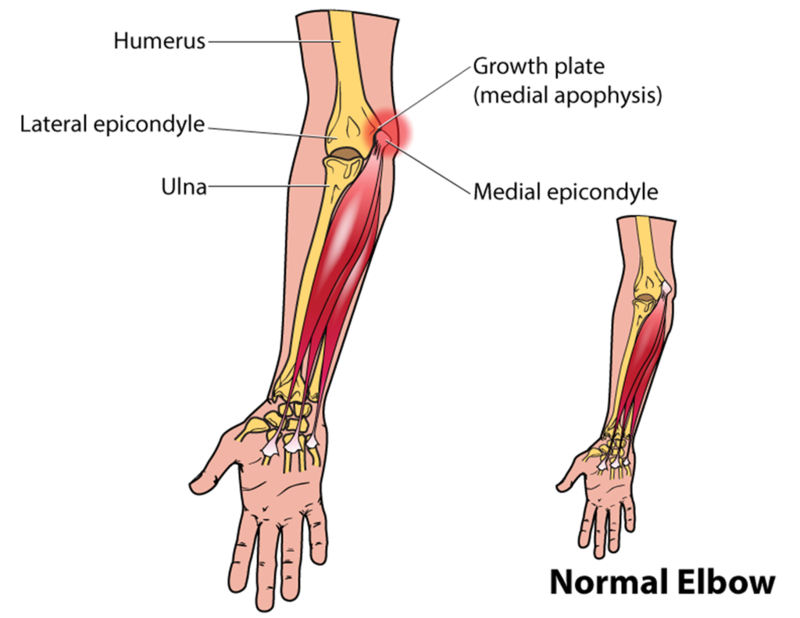 This injury occurs when repetitive throwing creates an extremely strong pull on the tendons and ligaments of the elbow. The pain felt to prominence inside the elbow. « Pitcher’s elbow » can become serious if the case gets worse. Repeated pull can tear ligaments and tendons of the bones. The tear can take tiny pieces of bone like when a plant takes piece of the soil when it uprooted. 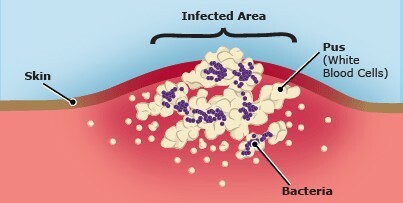 This can destabilize bone growth, which can create a deformity. Elbow injuries by lanching movements can become complicated cases, if they’aren’t treated. Stop throwing because continuing to do this can create major complications and may reduce a child’s ability to remain active in a throwing sport. If the pain continues after a few days of complete rest in the affected area or if the pain reoccurs when the throwing starts, stop the activity again until the child is treated. Surgery is sometimes necessary for serious injuries, mainly for girls older than 12 years old and boys older than 14 years old. Depending on the child’s injury, surgery may includes bone fragment removal, bone grafting or reattaching a ligament back to the bone. The recovery time depends on the age of the athlete and the severity of the injury. If the injury detected early and the modification of the activity begins, there will be little time required for the athlete to start the sport again. However, if the athlete continues to play despite the pain and other symptoms, it will take several months to heal the injury. Or it’s possible that the injury becomes permanent. The recommendation for a child to be safe is 15 for 8-10 years old, 100 for 11-12 years old and 125 for 13-14 years old. This involves training and competitions. To avoid pitching injury, young pitchers should play 3-4 inning each game.